Customers shouldn’t have to think too much about their user experience. If they do, they’ll flee to your competitor faster than your chatbot can load. Here’s what you need to know about getting the right user feedback. You create a Facebook ad that directs traffic to your site. For every 100 clicks, 25 users hang around for more at least 60 seconds. Only two users click your CTA. But wouldn’t it be nice to know what those other 23 users were thinking when they clicked out? When you have the right customer feedback strategy, your traffic will have much more potential. It’s no wonder everyone’s installing bots, especially when user response can increase conversions and sales. But which bot is right for you? Here are three user feedback types, the apps that power them, and what you need to know about feedback interfaces. To get good feedback, you have to have automation that’s easy on the user and convenient enough that you can collect data without too much effort. Below are three methods you can use to start collecting feedback on your website. If you want a high-volume response that’s easiest for your users, Net Promoter Score (NPS) is the clear winner. Instead of obtaining written feedback that a user needs to parse, you can ask users to rank their experience numerically or emotively. There are a few ways to achieve this, but one of the best ways is using emojis instead of numbers. It’s a bit more quirky as a visual but will gain more engagement than using the traditional number range. Emoji-based NPS often use a floating sentiment score, a small user interface prompting the user to choose a number or emoji to match their user experience. This has been a great source of getting a rapid amount of feedback and operates the same way customers review products on the App Store or on E-commerce websites. Emoji rating on the bottom left. We Recommend Emojics – These guys do a great job creating an emoji-based rating experience. Use Emojics if you want something lightweight for feedback and need a quick way of calculating a score. Their widget is a floating sentiment score that uses emojis as a way to capture NPS. Your feedback strategy should start with automation. All entry points to collect feedback should be easy on the user but also easy for the business to collect. 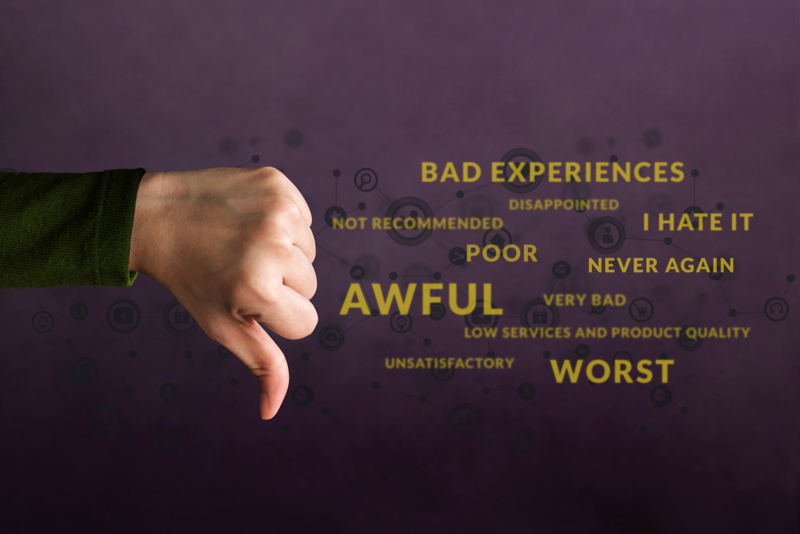 Below are three methods you can use to start gathering feedback on your website. Live chat is by far the most popular form of collecting feedback because it’s easy for the customer to type what they want in the chat form. But live chat is more time-consuming and costly because users expect 24/7 live chat conversations. If you don’t have the time or resources to engage with users and catalog each piece of feedback, you risk turning off users. 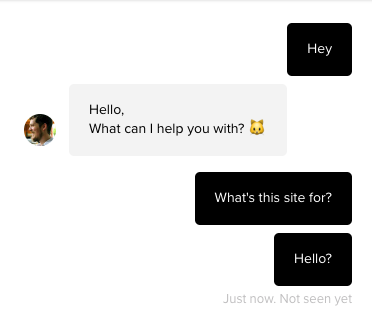 User feedback with live chat usually appears on a site as a floating bot icon, a small widget in the bottom right corner of the website that has become a universal standard. Most users are trained in where to go to send complaints, making it a seamless experience for users. We recommend Intercom – A household name in user experience circles, everyone knows that Intercom is among the most popular live chat tools on the internet today. Your users will know that little chat icon with the smiley face, but Intercom is pricey for startups and small business who can’t maintain live chat 24/7. We love websites like Quora where all our burning questions can get answers and see what others want to know. That’s why Q&A Experiences can be a great way to answer your user’s questions and guide the conversation, so you know what they’re looking for. Q&A gives users reassurance that they’re not alone and your website genuinely wants to help them solve the problem. Plus, when Q&A chatbots give users the option to submit a question, you can add their query to the list so the next user won’t get lost. 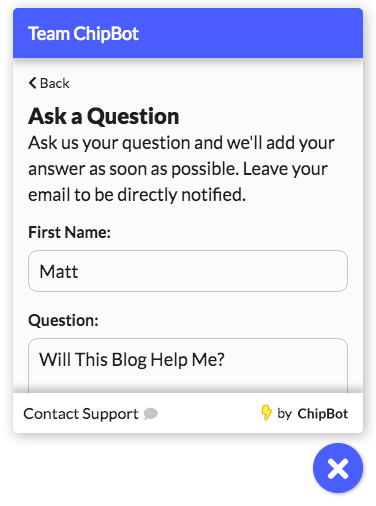 Q&A is what we do at ChipBot, which is an excellent tool for creating Q&A content that encourages user feedback, provides customer support, and saves you time. With Q&A support, you can get better insights on user behavior that make it easier to narrow in on potential issues. 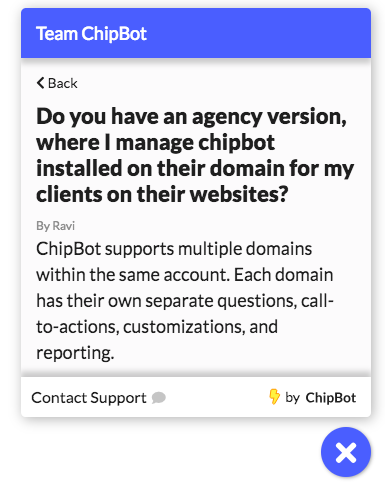 While you can offer your users more traditional tools like feedback buttons that appear across the global header of your website or inline, ChipBot gives you the opportunity to catch users when they could be struggling with a floating bot icon. Have an ability for your users to ask you questions. When a user is hitting friction on your site, your website must be ready to spring into action to hear them out! A good feedback loop can provide them with the answers they couldn’t find otherwise, create a dialogue, and provide you with what they were looking for, so you don’t miss an opportunity next time.